This is about Ririsha, one of the main avatars in The Thang. Long time ago, great shamans from different tribes came together with solid faith in On-Du alone, and they went to Yeredren, the land of mystery, to dwell. People in Om Lit Praga call these shamans On-Du Sham. They live quietly amongst themselves, concentrating on seeking truth rather than worldly affairs. However, as the Strength of Darkness becomes darker, they break away from long silence and reveal this secret place to help warriors. In this land of dry desert and of hermits, the secret of Kamalran (the essence of Strength resulted from On-Du Sham's long years of faith in On-Du) lies asleep. Ririsha is extremely intelligent; she can do a variety of magic using Yelba, Tar, Ohra, and Mir. 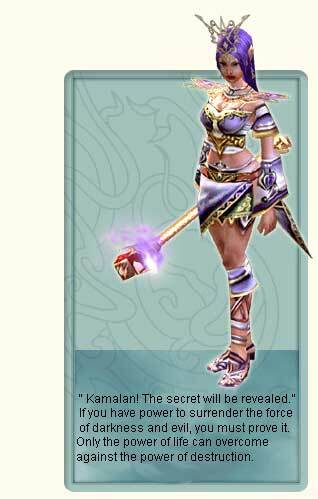 She also has the ability to integrate Kamalran with magic. Not even Lama-Shuham can imagine her true Strength of Kamalran. The following diagram is the initial stats of Ririsha at Level 1. Ririsha with Yelba Magic (Yelba-Na) - The higher the intelligence and sense are, the stronger the Yelba-Na becomes. Ririsha with Tar Magic (Tar-Na) - The higher the intelligence and Strength are, the stronger the Tar-Na becomes. Ririsha with Ohra Magic (Sham-Ohra) - The higher the intelligence and KI are, the stronger the Sham-Ohra becomes.